Meatballs are one of those easy go to meals in our home. I usually make a big batch and we eat on them that night with pasta and sauce. We have meatball subs later in the week with the leftovers and I freeze a batch so we can have them for a quick and easy meal when I forget to set something out. There are so many recipes out there for meatballs, but I like to keep it simple and very traditional. My kids love this recipe! Not to overpowering with the seasonings yet still full of flavor! ½ onion, grated or minced very fine. Combine all ingredients in a bowl and mix together well. Do not over mix. Shape into 2" round balls. Wetting your hands with water during this process will make the meatballs not stick to your hands and they will not crack or crumble when cooking. Place onto a lined cookie sheet sprayed with cooking spray. Cook for 20-22 minutes. Return to marinara sauce until ready to serve or let cool and freeze for a future meal! As I said before, this recipe freezes amazingly well! 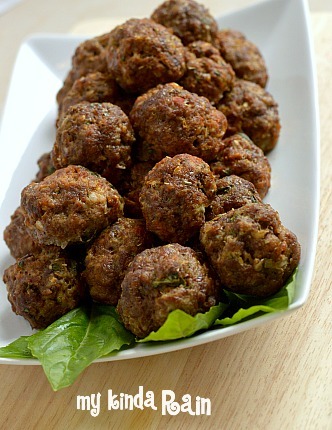 If you know someone who is about to become a new mom or maybe have an ill family member, why not make them some meatballs to add to their freezer so they can also have a quick meal. What is your favorite way to eat meatballs?